Braidy Industries invests $1.3 billion in the Appalachian Sky region with new aluminum mill focusing on the aerospace industry and creating 550 new jobs. Our tri-state region works together as one for your benefit.  The Appalachian Sky area of Ohio, Kentucky, and West Virginia offers a strong metal fabrication workforce. This includes 18,856 welding, soldering, brazing machine setters, operators, and tender employees — all centrally located in the Tri-State Aerospace Region. We also offer multiple available buildings and sites located adjacent to airport runways in all three states. Ohio offers proximity to the Southwestern Ohio Aerospace Manufacturing Community stretching from Columbus to Cincinnati through Northern Kentucky extending to Lexington. Wright-Patterson Air Force Base, near Dayton, is the largest Air Force base in the United States, supporting multiple aerospace activities and contracting over 27,000+/- military and civilian employees. It also serves as a major center for Air Force procurement and contracting. Its presence close to the Tri-State Aerospace Region offers a geographic advantage to the area. Kentucky offers very strong political connections to the U.S. Department of Defense and its considerable expenditures within the military aerospace industry, providing this area with unique opportunities within the Defense industry. Aerospace parts and services are Kentucky's leading export. West Virginia’s Tri-State Airport, located in Huntington, is designated a primary commercial service airport by the FAA. With more than 115,000 passenger boardings per year it provides commercial access to the entire region.